Acts 12.25: Did Barnabas and Paul return to Jerusalem? I wonder if anyone has any wisdom on this variant? EIS seems to be the best reading and most difficult reading (01 and 03, Maj, some versional support) with the alternatives both offering a smoother reading (EX: P74, 02, 33 1739 etc. ; or APO: D E 614 etc.). But commentators aren't generally very happy reading 'returned to Jerusalem' in a normal way since the logic seems to require a return from Jerusalem (cf. 11.29f). Hence a load of possible solutions, none of which seem that plausible. Here is the next instalment of the minuscule manuscript seminar sample (after a quiet pause). For earlier samples see Seminar One (ms 461; AD 835), Seminar Two (ms 1582; AD 949), Seminar Three (ms 623; AD 1037). So what do you make of this? I noticed in the journal of Leipzig University (vol 1., 2007, p. 17—don't normally read it but Rob Price passed on a copy) that they have produced a 48-page 'richly illustrated brochure' (reich bebilderte Broschüre) on the Sinaiticus material in Leipzig. Sells for 7 Euros in cash on the spot, or 9.80 Euros from the University press. This book is about Oxyrhynchus - the city of the sharp-nosed fish (see picture) and is a book for 'the general reader', which will 'illustrate some aspects of life in Oxyrhynchos, a Greek city under Roman rule, from the original documents'. It has some lovely photos (of documents, mummy masks, locations etc. ), and should be of interest to people interested in early New Testament documents. In 1897 two Oxford archaeologists began digging a low sand-covered mound a hundred miles south of Cairo. When they had finally finished, ten years later, they had uncovered 500,000 fragments of papyri. Shipped back to Oxford, the meticulous and scholarly work of deciphering these fragments began. It is still going on today. As well as Christian writings from totally unknown gospels and Greek poems not seen by human eyes since the fall of Rome, there are tax returns, petitions, private letters, sales documents, leases, wills and shopping lists. 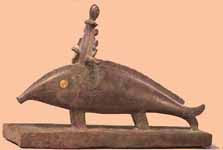 What they found was the entire life of a flourishing market-town - Oxyrhynchos ( the city of the sharp-nosed fish' ), on a side branch of the Nile - encapsulated in its waste paper. The total lack of rain in this part of Egypt had preserved the papyrus beneath the sand, as nowhere else in the Roman Empire. We hear the voices of barbers, bee-keepers and boat-makers, dyers and donkey-drivers, plasterers and poets, weavers and wine-merchants, set against the great events of late antiquity: the rise and fall of the Roman Empire and the coming of Christianity, as well as the all-important annual flooding of the Nile. The result is an extraordinary and unique picture of everyday life in the Nile Valley between Alexander the Great in 300 BC and the Arab conquest a thousand years later. Parsons was Regius Professor of Greek at Oxford (1989-2003) and directed the Oxyrhychus Papyri Project for many years. He also once wrote me a very nice letter. He also refers to the proceedings of the centenary conference in 1998 as forthcoming: A.K. Bowman, et al (eds), Oxyrhynchus: A City and its Texts (London, forthcoming, 2007). Jan Krans blogs on Codex Boreelianus here. Apparatus Criticus is an academic email list which focuses on the study of manuscripts and textual criticism. This includes the study of manuscript traditions, apparatus critici, palaeography (paleography), epigraphy, the restoration of fragmentary texts, emendation proposals, and text-critical methods and applications. Other topics include major thinkers and innovators in the fields, such as A.E. Housman, Karl Lachmann, L. D. Reynolds, or relevant literature like Texts and Transmission: A Survey of the Latin Classics or Scribes and Scholars: A Guide to the Transmission of Greek Latin Literature. The material should be limited to ancient literature of the Western World, the Graeco-Roman classics, Jewish or Christian works, the Qur'an, ancient papyri, etc... all before the invention of the printing press. All posts should be on topic and within the scope of the stated description. The list owner expects all posts to be evidenced by facts and scholarship. A working knowledge of either Greek, Latin, Syriac, Coptic, Arabic, or other languages of the texts in question is necessary for discussion on an actual text. As a moderated list, members are ideally professionals working in a related field. Students are welcome, and so are others interested in seriously pursuing the subject matter, but both are expected to conduct themselves with professional decorum befitting a real academic event. A month ago I was in Uppsala university library to look at some of our Greek New testament manuscripts here in Sweden. It is always interesting to see in a special registry who has examined the MSS before me. I recognized some names, Hoskier, Harlfinger, Djuric... I collated two of the MSS in Jude (442, 1852) to compare with my collations from microfilm, and to see if anything new should turn up when I had the physical evidence in front of me. Lo and Behold! There was another marginal reading in 1852 in greyish ink; the ending -AS beside the line with TWN ASEBEIWN in v. 15. So if you have my dissertation with the complete collation of manuscripts in Jude, you can now add (ASEBEIAS as marginal reading of 1852Z in v. 15). This also means a correction to NA27 (and ECM) for the same MS. This little detail was probably not visibile on the microfilm I examined in Münster. Otherwise, just two uncertain letters in my transcription were now confirmed. In a few weeks I will travel to another collection to collate another MS, which I hope will offer new surprises. More on that later. I came across what is the shortest bibliography I have yet seen in a PhD on textual criticism: 22 items, mostly reference works. J.R. Miles, Retroversion and Text Criticism: The Predictability of Syntax in an Ancient Translation from Greek to Ethiopic (Scholars Press: Chico, CA, 1985). Does anyone know of any other contenders? Bibles.org.uk has published the facsimile of Erasmus' third printed edition of Greek New Testament, originally published in 1522. Colophon to the Apocalypse contains the date 1522 but the Introduction says 1518. It contains both the Greek and the Latin (Erasmus' own translation) texts in parallel columns. This is the first printed edition of Greek NT to contain the Comma Johanneum (I John 5:7-8), howbeit in a rather unusual form. This edition was used by Tyndale for the first English New Testament (1526), by Stephanus as a base for his 1550 edition and by the translators of Geneva Bible and King James Version. The direct link for ordering this edition is here. John Hobbins gives an extensive review of BHQ here. I read a post on the blog of Tim Sneath ("Musings of a Windows Vista Technical Evangelist") about the new "Turning the Pages" technology developed for the British Library. The news is two months old, but nevertheless quite interesting. "I'm going to start off this series with a real blockbuster that was announced just this morning. I've been looking forward to the moment when we could reveal this application for months, as I think it's one of the most exciting applications I've ever had an involvement with." In reading the latest issue of JETS the article by John Noe includes a reference (derived from James M. MacDonald) to the “Syriac version of the Bible” which apparently entitles Revelation as “The Revelation which was made by God to John the evangelist on the island of Patmos, into which he was thrown by Nero Caesar.” Is this peculiar to one particular ms or is it widespread? It would provide evidence that some in the Syriac church dated Revelation to the 60s. The prologue to Revelation includes up to 60 different wordings (cited by H.C. Hoskier, Concerning the Text of the Apocalypse: Collations of All Existing GreekDocuments , 25-27). I think the TR includes a reference to “John the Theologian” and 1775 includes the longest description: “The Revelation of the all-glorious Evangelist, bosom-friend [of Jesus], virgin, beloved to Christ, John the theologian, son of Salome and Zebedee, but adopted son of Mary the Mother of God, and Son of Thunder” -- that’s quite an introduction! Monographs of the Peshitta Institute Leiden, 15; xxiv, 416 pp. For the first time, this volume brings together biblical scholars and specialists in Syriac liturgy and patristic literature. It contains introductory essays on the Syriac versions in the liturgy, the Syriac Old Testament commentary tradition, and the challenges posed to exegetes by the different Syriac versions of the New Testament, written by the leading scholars in the field. Twenty-one further contributions discuss the patristic and liturgical evidence for the development of the text of the Peshitta and other Syriac versions, as well as the reception and use of those versions in the exegesis and liturgy of the Syriac Churches. These studies are fully updated versions of the papers read at the Third Peshitta Symposium, held in Leiden, 12-15 August 2001. To go to Brill advert, click here. 1) What is the earliest occurrence of the full form χριστος in a Greek NT ms? 2) What is the earliest occurrence of the full form χριστος in any ms? 3) What is the earliest occurrence of the form χρηστος in a Greek NT ms? Does it even occur? 4) What is the earliest occurrence of the form χρηστος in any ms? I think you can guess where I'm heading. Christian-B. Amphoux and J. Keith Elliott, eds. Alexandrian Error and Byzantine Re-authentication? A most intriguing discussion occurs in Metzger's Textual Commentary in relation to the NA/UBS reading at Acts 9:25a. The preferred reading of those editions is LABONTES DE OI MAQHTAI AUTOU NUKTOS, supported by p74 Aleph A B C 81c pc vg-st,ww; whereas the Byzantine MSS (as well as E Psi 33vid 1739 gig vg-cl sy, and, with variation, 6 81*; with conflation 1175) read LABONTES DE AUTON OI MAQHTAI NUKTOS. The difference involves more than just a change of word order, being reflected in various modern translations as either "his disciples took him by night" — indicating Paul's own disciples; or "the disciples took him by night" — indicating believers in general. The consistent pattern in the book of Acts (some 30+ occurrences) is to state "disciples" without a modifier, even when it is obvious that certain believers are a disciple of a given person (e.g. Ac 19:1, disciples of Apollos; 20:1, 7, Ephesian disciples of Paul, etc.). The only modified occurrence of the word appears in Ac 9:1, but even there it is inclusive, "the disciples of the Lord". Metzger, Textual Commentary, admits that OI MAQHTAI AUTOU appears to be "the oldest reading extant in the manuscripts," and of course this explains the main text reading of NA/UBS. Yet Metzger immediately provides compelling reasons why the "oldest reading" -- as found among the Alexandrian witnesses -- cannot possibly be correct: "it is scarcely conceivable that Jewish converts to Christianity at Damascus would be called 'Paul's disciples'"; nor can "the genitive AUTOU" be "construed as the object of LABONTES"; nor can it be "gratuitously" assumed "that these disciples had been Paul's 'companions on the way to Damascus, who . . . had themselves come to the faith". "The most satisfactory solution appears to be the conjecture [!] that the oldest extant text arose through scribal inadvertence, when an original AUTON was taken as AUTOU" -- i. e., the Byzantine AUTON indeed is original, but not as it appears within the Byzantine Textform! "Here AUTON has been misread as AUTOU . . . The reading AUTON in the later MSS is thus a correction [!] which — for once — is correct" (Haenchen, 332n3)! Thus — even though all the evidence points to the Byzantine AUTON as the original reading in this location, those who reject the Byzantine text under almost all circumstances instead prefer to hypothesize a conjectural "original" reading that became totally "lost" through error permeating all earlier MSS, yet which "error" then was "corrected" by the mass of later Byzantine scribes. Forgive me for asking, but why should Occam and his Razor not be applied in the present instance? Why engage in speculative gymnastics and textual legerdemain to defend as "conjecturally original" a reading that clearly exists among the vast mass of manuscripts? Certainly the simpler solution would be to admit "Alexandrian archetypal error" at this point. I suppose the real difficulty is similar to the problem faced by Westcott and Hort when they could not bring themselves to acknowledge "Alexandrian non-original interpolations" at those points termed "Western non-interpolations." But even so -- if Metzger's opinion reflects that of the NA/UBS Committee, why then should they not have "conjectured" the "original [Byzantine] reading" as the main text rather than publish what appears to be held as incorrect on all counts (as cf. Ac 16:12)? More importantly, what then about all the various modern translations that continue to perpetuate this acknowledged error by reading "his disciples" in Acts 9:25? Food for thought. Plans are underway for a session at SBL this autumn in memory of Bill Petersen. Topics likely to be included are Romanos, the Diatessaron and Patristic evidence for the text of the NT. Bart Ehrman's Misquoting Jesus is now available in paperback. To judge by the image at Amazon.com the Hebrew on the cover is still upside down. The following is a much-abbreviated list of texts germane to TC which are available in reprint from Scholarly Reprints (which is a division of Good Books). I have only included authors’ names and titles for the sake of brevity. In the case of the more well known authors, there are one or more books also available which I have not listed below. The books are offered at a reasonable price, and are well-bound. My only qualm is that, in the case of the editions with which I have worked, that they use only the recto of each page making the books larger than necessary. Some of these works are also available online. Just click on the title. Brodie, James. The True Text of the Old Testament. Buhl, Frants. Canon and Text of the Old Testament. Kennicott, Benjamin. Vetus Testamentum Hebraicum. Weir, Thomas. A Short History of the Hebrew Text of the Old Testament. Bengel, Johannes Albrecht. Apparatus Criticus ad Novum Testamentum. Burgon, John William. The Causes of the Corruption of the Traditional Text of the Holy Gospels. Deissmann, Adolf. Light from the Ancient East. The New Testament in the Light of Historical Research. Ferrar, William Hugh. A Collation of Four Important Manuscripts of the Gospels. Goodspeed, Edgar. Greek Gospel Texts in America. Gregory, Caspar. Die Griechen Handschriften des Neuen Testaments. Harris, J. Rendel. Codex Bezae. Hoskier, H.C. Codex B and Its Allies. Concerning the Text of the Apocalypse. Kenyon, Frederic G. The Palaeography of Greek Papyri. Recent Developments in the Textual Criticism of the Greek Bible. Nestle, Eberhard. Introduction to the Textual Criticism of the Greek New Testament. Scrivener, Frederick. 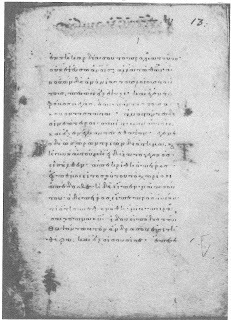 An Exact Transcript of the Codex Augiensis. Tischendorf, Constantinus von. Novum Testamentum Sinaiticum. Tregelles, Samuel Prideaux. An Account of the Printed Text of the Greek New Testament. Von Soden, Herman. Die Schriften des Neuen Testaments. Westcott, Brooke Foss; and Fenton John Anthony Hort. The New Testament in the Original Greek. The weblink offers no contact information except for a mail-in order form. I have found a phone number for Good Books listed on Bible Research’s recommended books page. Austin Farrer famously explained the ending of Mark as due to the fact that the real ending had been eaten by mice: "the end of the story has been eaten by mice" [A.M. Farrer, A Study in St. Mark (London: Dacre Press, 1951), p. 173]. So I was thinking that it would be a useful advance on scholarship if we could catalogue the impact of animals on biblical manuscripts. Only offerings? Here are a few personal lines of what is going on in relation to my research just now. On Tuesday I traveled from my hometown Örebro to Lund university (500 km). On that day I completed my final course in the PhD programme, which means that I officially earned the degree that day, although the real trial was of course the examination in December previously reported on this blog. After having earned my degree I could also apply for a research post which has been announced (and the final day for application was March 7). I had prepared the application 16 pages long. For the description of the research project (3 pages) I wrote my short proposal last weekend under the heading: "'Orthodox Corruption' Revisited: Scribal Motivation in New Testament Textual Transmission". I do not think that I will get the post, because I saw who some of the other applicants were (folks that have earned their degree during the last five years are eligible). In any case, I will write something on the subject, as soon as I have time, but I have to prepare papers for three conferences (Birmingham colloquium, SBL International and Annual Meetings). In the afternoon I went to the exegetical seminary (OT + NT), which funny enough was a presentation of a paper by professor Bengt Holmberg on Bauer's thesis with the title "Did Heresy Emerge before Orthodoxy? Walter Bauer's Thesis on the Earliest History of the Church in Later Research" (my quick translation). Two of the questions for the discussion that followed was: a) How much (justified) critique can an historical hypothesis be subjected, before it "suffers the death of many qualifiations? "; and b) To what degree does the erroneous terminology, "orthodoxy" and "heresy," affect the result of an (historical) examination? I spent the Wednesday morning in the university library, where there is a collection of 800 papyri, which has been completely forgotten since the 30's! Back then, an interested librarian bought them for the university, and from that particular purchase, the other part of this particular lot went to Ann Arbour in Michigan so maybe in APIS some items will be reunited in the digital realm. Only 50 of the papyri have been edited. Now there is a project in co-operation with APIS to digitize the lot. I saw about 20% of the collection on Wednesday. They were brought out in boxes that contained the papyrus items mounted in glass. However, this had been done 75 years ago, and the tape around the glass had dried out, so the glass fell open, and out the very fragile fragments, some of which lay in the bottom of the box!!! I am glad that there is now a conservation project going on, but only one person is working on this project, and it will take a long time. I did not discover any Christian papyri, but some of the items contained religious language (APOLLWN, hAGIOS, MEGALOS QEOS), but no nomina sacra were spotted. Textual criticism is a glorious field of study whose landscape is dotted with monuments of past and present erudition. The question I address in this post is to the degree to which the field is currently navigable online, and prospects for voyages in the future. In the interests of brevity, I confine my attention to a few aspects of the question only. A new dynamic is operative in the world of information exchange, whereby, more and more often, something new from the point of view of method or content first becomes available free of charge online and only later is repackaged for sale in a market. For this and other reasons, there are a number of online resources out there for anyone to use that lack as yet a better equivalent in the commercial sphere. This holds true for the field of text criticism as much as for any other field of study. This is a healthy situation, unless one holds to the view that Mammon must always be king. For my part, I have a demythologized view of Mammon, with a corollary: the purpose of an information market is not to make money per se, but to provide a venue that ensures support for and dissemination of original research and tools of the trade. To ring the changes on an eternal verity, the market was, or should be, made for man, not man for the market. The line between online resources available free of charge and those which cost a pretty penny needs to become blurrier than it is now, so that access to the former becomes a portal to access to the latter, and ownership of a paid-for resource brings with it enhanced access to resources available to all. Someday any book worth paying for will include an online dimension. Reference works will be updated electronically on a continuous basis. Examples of both, of course, are already out there. How this works for the moment and how it should work are often two different things. An example or two may serve to illustrate. Let’s say I am interested in researching the Peshitta as a text-critical resource for the study of the Hebrew Bible and/or the New Testament, a key component of the Aramaic linguistic and literary heritage, and a magnum opus in its own right, knowledge of which is essential for an understanding of Syriac Christianity. Ideally, in my view, I would be able to go to the site of the Leiden Peshitta Institute, access the text in the form of a tagged database free of charge, and in that context be offered other tools, both free and commercial, that will allow me to study the Peshitta in its various facets. In reality, when I go to the site, I find no more than a list of the Institute’s ongoing projects and links to lists of the fascicles of the Major Edition and the monographs of the Institute which have so far appeared. The cute picture of an unidentified researcher, of course, makes up for this. But still. At the very least, one would have wished for a link to CAL, where part of the Peshitta Institute’s own database has graciously been made available to those who use CAL online. On the other hand, the OT Peshitta is not available in the for-pay version of CAL through Logos-Bible-Software. This is unfortunate. Furthermore, the purchasable items in the Institute’s lists are cold, so one has to look elsewhere for a place to buy them. In this regard, a good place to start is Eisenbrauns, and if one plugs “Syriac” or “Peshitta” into the online search engine, all kinds of excellent purchasable resources pop up, but not the Leiden Peshitta edition itself! The best way to examine and purchase volumes of the Leiden Peshitta online is to go to Brill’s site, and from there to its links to books.google.com via ISBN number. It is then possible to take a look at a volume’s cover, peruse its table of contents and so on, and choose a bookseller from which to purchase. Here’s an example of what I mean: books.google.com/leiden-peshitta-isaiah. Beyond that, an almost complete listing of the Institute’s published monographs purchasable new or used is available at amazon.com-search-keywords=Monographs+Leiden+Peshitta. One more example. Let’s say I’m interested in the Septuagint for reasons like those stated above with respect to the Peshitta. Here the situation is different, thanks to the marvelous site on the Septuagint and resources in the field offered by Joel Kalvesmaki. The site is literally priceless. On the other hand, despite what Joel says, it’s not necessary to buy the Göttingen critical editions of the Septuagint via their publisher. You can purchase them at Eisenbrauns. After winning the lottery first. I keep hoping that I will wake up someday, go to eisenbrauns.com, and discover that it has become a one-stop shop for all my needs as a biblical scholar. It’s not that I’m expecting, necessarily, to find Gabriel Afram’s Swedish-Syriac-Dictionary among its listings, the very existence of which warms my cockles. But it is my hope that a commercially viable way will be found for Eisenbrauns’ book catalogues to become a comprehensive portal to the purchasable print and electronic resources of the fields of study they cover. I can dream, can’t I? I also keep hoping that someone will gather and introduce to the rest of us online resources available in other subfields of the textual criticism of the Bible with the same alacrity as Joel has done for the Septuagint. If you look long enough, you can find real gems, like this. But who has time to do all that looking? I've just stumbled across the charitable site Christian Hospitality and found that it has a veritable wealth of patristic and related material scanned in. I was actually searching for the text of Moses of Chorene, but found much more. All the Ante-Nicene and Post-Nicene fathers appear to be here, though they can also be found at CCEL. More welcome, however, are some original language resources, e.g. Harvey’s edition of Irenaeus. The site apparently looks back to one William Branham as a prophet of some sort. Critical edition of the Armenian version? Louis Leloir in K. Aland (ed. ), Die alten Übersetzungen des neuen Testaments, die Kirchenväterzitate und Lektionare, 1972, p. 306, mentions the preparation by the Armenian Orthodox Patriarchy of St James in Jerusalem of a new critical edition of the entire Armenian Bible. Does anyone know of any more recent news on this project or any one that may have developed from it? The Sahidic NT (and the Gothic for that matter) are now available at the Unbound Bible. It really looks as if it is searchable, but I cannot actually get it to search on Coptic words. Can anyone else achieve success?